Mega Sale! Free Shipping Included! Save 22% on the FoodSaver V4440 2-in-1 Automatic Vacuum Sealing System with Bonus Built-in Retractable Handheld Sealer & Starter Kit, Black Finish by FoodSaver at Zvejo Tribuna. MPN: FSFSSL4440-000. Hurry! Limited time offer. Offer valid only while supplies last. 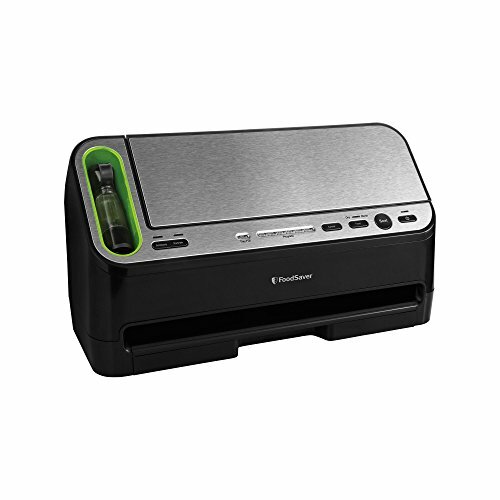 The FoodSaver 4440 combines both a handheld and a standard vacuum sealer. This 2-in-1 FoodSaver appliance is vacuum sealing versatility at its best. The FoodSaver 4440 combines both a handheld and a standard vacuum sealer. This 2-in-1 FoodSaver appliance is vacuum sealing versatility at its best. Automatic bag detection and vacuum sealing means two quick and easy steps to seal and save. When sealing zipper bags, containers and canisters, the convenient handheld retractable sealer eliminates the need for additional attachments. One unit does it all. Features of Foodsaver FSFSSL4440-000 Appliance Vacuum Sealer: 1.Retractable Handheld Sealer 2. It fits nicely in your hand when you use it, then tucks away out of the way for storage. Automatic Bag Detection and Vacuum Sealing Simply insert the bag you wish to seal in the sealing area, and it senses that a bag is there and begins sealing immediately. 3.All- in- One DesignWith the retractable handheld sealer also comes an added bonus of adding attachments to this machine to augment its already stellar performance and give you the option to seal jars, containers, canisters, and even zipper bags. In addition, you can use the classic vacuum and seal bags. 4.11 Inch Sealing Capacity The FoodSaver 4440-000 can accommodate bags up to 11 inches in width, and is compatible with the 11 inch FoodSaver rolls and bags. 5.Removable Tray The removable tray on this food sealer is very convenient and makes clean up a breeze. 6.Wet/Dry Seal Options This model has a toggle switch to choose whether you are sealing a wet or dry item, helping you to create a perfect seal every time. If you have any questions about this product by FoodSaver, contact us by completing and submitting the form below. If you are looking for a specif part number, please include it with your message.